Grace Bay Beach at the Seven Stars Resort. 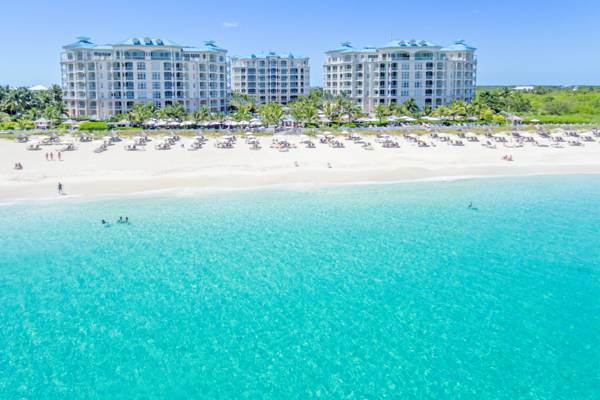 This luxury resort is excellently located on Grace Bay Beach. The exclusive Seven Stars resort is a premeir luxury beachfront accommodation in the centre of Grace Bay Beach. The resort offers a prime beach location, several dining choices, a spa, and a wide array of water sports and activities. Seven Stars features 115 rooms, with one, two and three bedroom options, with a choice of oceanfront, ocean view, or garden views. All rooms have furnished terraces or balconies. The contemporary Caribbean suites at Seven Stars include a full kitchen with granite countertops and high quality GE appliances, spacious bathrooms finished in marble, air conditioning, and complimentary WiFi in both rooms and around the resort. Entertainment options include large flat screen TVs and sound systems. Seven Stars offers everything needed for a tranquil stay. The large free-from heated swimming pool fronts the resort, and has the perfect backdrop of the turquoise Grace Bay. On the beach, there are Hobie Cat sailboats, ocean kayaks, stand up paddle boards, and snorkelling equipment for guest use, as well as loungers and shade cabanas, both on the beach and poolside. There’s also a business centre, a book and DVD library, a fitness centre, and lit tennis courts, as well as a full-service onsite spa that offers a complete range of wellness and beauty treatments. Yoga classes are also hosted, with the tranquil backdrop of the ocean. Seven Stars is also a great family resort. In addition to the wonderful beach and pool, there are supervised outdoor activities that are hosted by the Kid’s Club, including sailing lessons and eco trips. The pool and ground at Seven Stars resort, Turks and Caicos. Seven Stars is located on an exquisite stretch of the world famous Grace Bay Beach. This amazingly-turquoise coast features sugar-soft white sand and crystal-clear water. 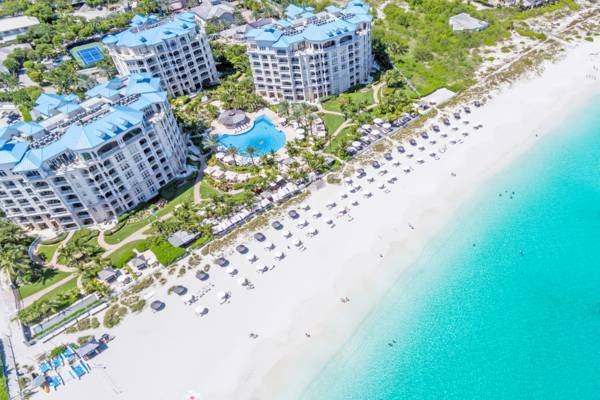 A vibrant barrier reef system with exceptional scuba diving protects Grace Bay and the north coast of Providenciales, so the ocean is calm and ideal for relaxing in. As part of the Princess Alexandra National Park, jet ski use, fishing, and excessive vessel speed is prohibited in Grace Bay. If you’re looking to discover more of the Turks and Caicos and our pristine environment, consider taking a boat charter or snorkelling cruise through the Caicos Cays. Most excursions pick up guests on the beach fronting their accommodation, which is a perfect way to start the adventure. Seven Stars is home to three dining options: Seven restaurant, The Deck, and the casual Sand Dollar beach restaurant. The fine dining Seven is headed by executive chef Edwin Gallardo and serves a menu of gourmet international dishes and seafood. The dress code is smart casual, and reservations are recommended. The casual Deck overlooks Grace Bay and is the perfect place to enjoy an evening drink or watch a spectacular sunset. The menu here is inspired by Caribbean and local fare, yet there are many international and American dishes as well. Private dining on the beach, complete with butler service, is also available. The Sand Dollar restaurant and bar offers lunch in an outdoor setting by the pool. A complimentary continental breakfast is provided with stays at the Seven Restaurant. Seven Stars is found in the central Grace Bay, and quite a few stores, restaurants and shopping plazas are within short walking distance. There’s the small yet select Graceway Gourmet supermarket, the Grace Bay branch of Scotia Bank, and many restaurants and shops. Seven Stars is one such accommodation where we feel that a rental car may not be needed, especially if you’re visiting with the intention of spending most of your stay on the incredible Grace Bay Beach. The resort offers the complimentary use of bicycles, which are perfect for exploring the Grace Bay region. Taxis can typically be found waiting both at Seven Stars and at several surrounding plazas and resorts. Seven Stars and Grace Bay is located about 15 minutes by car from the Providenciales International Airport.